A decade or so ago, when Brian Reilly was President of the IES ANZ, he suggested that he and I should look for a really bad lighting installation that we could use as a joke in the annual awards to lighten the mood, albeit that it would no doubt be controversial. Sadly, we found no truly awful examples. Today, we would have had our pick of them, both here and abroad, and that has left me wondering if the lighting world is evolving backwards. Take the McDonald’s restaurant in New South Wales I wandered into recently. Now this restaurant has somehow discovered ‘Cheshire cat’ LED downlights - they are sometimes on and sometimes not and sometimes they also flash erratically in between. No doubt a theme park would pay good money to have that effect programmed for their Tower of Terror, though I doubt the higher-ups at McDonald’s would be similarly enthusiastic. I know that the late great Charlie Bell (McDonald’s’ ex-CEO) would have seriously questioned our lifelong friendship if I had been the perpetrator of this somewhat unusual approach to the lighting of one of his restaurants; McDonald’s are serious about optimal lighting for their patrons. Then there are the lighting installations in Manila that I inspected last week. In a shopping mall, some Megabay Accento uplights caught my eye: a very good choice for uplighting of the palm trees but some very clever person had decided to both use a wider beam angle than ideal (and available to them from the standard range) and to opt out of Megabay’s excellent antiglare snoots. Their error and the resultant glare are both blindingly obvious. I can only imagine the joy that manufacturers like Megabay must experience when they see their lights installed like this, with little regard to best lighting practice. Probably best we don’t tell them. Not to be outdone, an Italian restaurant nearby has large suspended chandeliers throughout that are adorned with lots of fake candle lamps. Thematically correct perhaps and electric candles do last longer and tend not to burn the building down, but the 1,850K one might expect from a real candle was actually an erratic mix of both 3,000K and 5,000K, no doubt from LEDs. Unless the owners have reimagined a candle as somehow igniting various gases along with the combustion of its wick in wax, no real candle has ever looked like that; and the result is pathetically naff and jarring. And then there is the Burger Bar a few doors further on, where the entire dining area is lit with AR111 downlights. These are the twin adjustable lights in suspended rectilinear forms that are so popular in retail and, as a piece of furnishing, they look the goods. Unfortunately the aiming of these lights included a direct line of sight into their point sources for most patrons. Ouch. These are costly architectural luminaires, so I imagine the owners or the designers wanted them to be fully appreciated. Which is why they aligned them perfectly with the slatted ceiling, instead of raising them up slightly so that the slats would hide them and their nasty point sources from view. To hell with the patrons’ comfort – look at my expensive lights damn you! My hotel in Manila was not immune to the joys of crap lighting: it has an undulating, and no doubt expensive, wave-shaped ceiling as an architectural feature in the foyer. 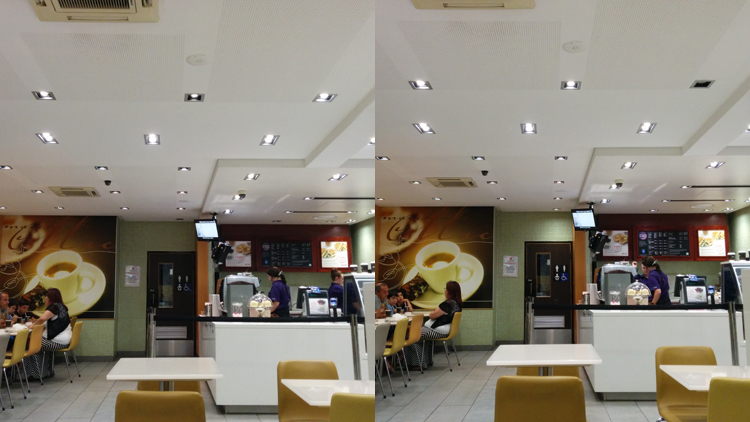 Sadly, the ceiling is somewhat marred by a variety of square downlights aligned at odd angles and whose distribution bears no discernible relation to the furniture layout, the flow and characteristics of the space or to, well, anything really. To add insult to injury these lights are equipped with so many different colour temperatures that they defy both logic and any sense of aesthetic. And when was the last time you saw a wall light that has been cabled from above and the installers had also not bothered to use a suitable IP-rated cable gland? The ones I saw recently were IP66 and so water tight that the entire light admitted no water, but conversely was full of water, courtesy of the top entry unsealed cable. Strangely, the lights no longer emitted light and I imagined hearing one gurgling ‘please mister, drill a hole in my bum, I’d be ever so grateful’. Or maybe it was saying ‘kill me’ over and over, it’s kind of hard to tell, when the light’s got a mouth full of water. Encountering so many examples of crap lighting wherever I go has left me wondering if all these lighting installations weren’t actually intended as a joke. Just wish I knew the punch line.